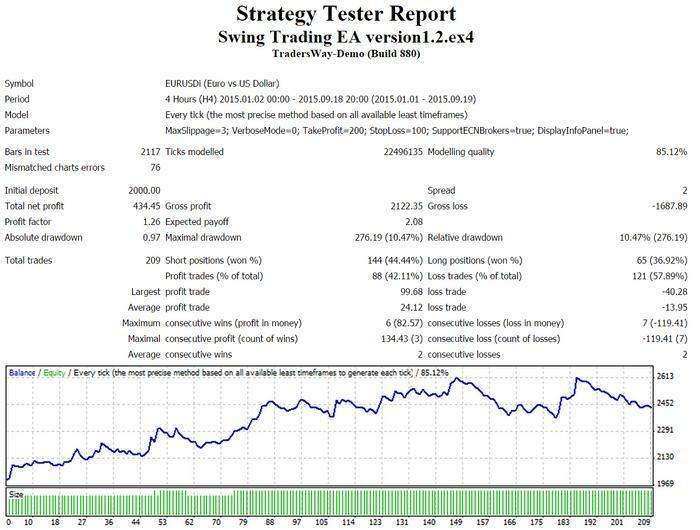 Here's the latest version for Swing Trading Robot for the year 2015. CCI, MACD, RSI, DeMarker, Bulls Power, Bears Power, and Money Flow Index. That's a lot of built in functions. This is a test result for broker offering 1:200 leverage. Time frame trading on chart: 4 Hour. This version1.1 robot uses martingale to double the lot size every time it is wrong on a trade. In this version, the EA only trades on 2% risk. The robot is only design to work for the year 2015.